China is spreading their wings blanketing much of Asia in the shadow staring up the claws and talons of the Chinese dragons armed with missiles covering every corner of her neighbors. South Korea, Japan and the Philippines face the combined threat of an expansive reach, possibly overreach from China and the growing ballistic and nuclear potential from North Korea and all from shorter ranged ballistic missiles, just the ones the Iron Dome is so proficient at intercepting. Israel has good relations with much of the Asian nations such as India and also China and could always use a few more friends. The recent test by North Korea of a nuclear device which had the highest yield of any device thus far tested by the secluded and often surly in their relations with the neighboring nations, especially South Korea and Japan , has led to a troubled area with furrowed brows. Israel has the perfect solution for addressing potential threats from North Korea and their rockets, missiles, mortars and even artillery rounds with a highly successful interception rate in the neighborhood of ninety percent. The Iron Dome systems have proven their effectiveness against actual war time footing in the last Gaza conflict. Israel could offer the Iron Dome to these nations in a very affordable and mutually beneficial exchange where for every so many units purchased the nations also finance the production of an additional Iron Dome system for Israeli use. Such an arrangement would be of obvious benefit to all the nations involved in such an arrangement. The United States who had been assisting with the production of the Iron Dome in exchange for access to some of the research and operational data of the system and the production of some of the system’s units by the American company Raytheon has already taken their pound of flesh. Such an arrangement would benefit all involved and would provide Raytheon business in the production of their section of the systems thus also benefitting the United States. Why would Israel seek to offer their most proficient indirect weapons fire interception system to foreign Asian nations when there are presumably agreements with the United States for further production of additional units? The recently signed defense agreement signed between Israel and the United States set into motion a steady reduction in monies reserved for Israeli defense industries. This may reflect on further financing the Iron Dome systems in Israel independent of influences in Washington D.C. Whether Israel will continue to have a friend in Washington D.C. will be heavily dependent upon the results of the coming elections for President as well as for Congress. Israel needs to hope for the best but prepare for the worst. These last eight years have placed relation between the White House and Jerusalem in the most parched regions of the driest and hottest desert known to man and depending on the election the next four years could just as easily be more of the same. Neither candidate for the Presidency has made foreign policy the main theme of their campaigns which is understandable with the American public more focused on the economy and jobs caring little about the rest of the world beyond reducing legal and ending illegal immigration until the economy warrants the need for foreign workers. Both candidates will necessarily concentrate on the economy first and foremost and foreign relations will be a back burner issue unless events cause the American public to sit up and take notice and keep their attentions. The American public has a remarkable ability to look up and see beyond their borders only if the noise is loud enough but even when they do look up, they return to their daily concerns with unfathomable speed continuing as if their attention had never been diverted. The resilience of their ability to focus on everyday life and only passing attention beyond their drive to and from work, their job or finding one, and their family, disregarding the remainder of the world as if it was a bothersome mosquito whose droning wings are but an aggravation is their best coping method and the world’s bane. This may be to the detriment of Israel as well as other nations who may depend on the United States government and particularly the White House actually looking beyond their borders when the most pressing problems echoed by the media is jobs, jobs, jobs and the economy and in an extreme situation, immigration. Terrorism, well, only if there are a series of devastating attacks within the United States itself with potential for momentary interruption if there is striking news from abroad, but such news passes from the news and the attention span of the busy Americans is brief for anything not immediately on their view screens. The news networks in the United States spend more time on the weather and even more on sports with little room for international news which they run through as quickly as possible avoiding it altogether when possible as their advertisers know the public and the public cares more about the cat rescued for the little girl from a tree or some viral video than they want hard news. It is no wonder why the United States Congress and the White House are hard pressed to tune into the international front when they are rewarded almost uniquely for taking care of the home front leaving the world to do as it will. The American citizens believe that the two great oceans protect the United States just as much if not more effectively than the military. One would think that the terrorist strikes they have suffered would have disabused them of this notion, but like any normal person, the average American prefers to believe that they are safe and comfortable within their little cocoons with the remainder of the world locked out. Granted the United States is the size of a continent and reach from ocean to ocean and are bordered largely by Canada and by Mexico for a far shorter southern border which most Americans simply would love to see it closed but unless pressed mostly do not place that concern at the top of their to worry list. What does this have to do with Israel? Well, their future has been tied to the United States in the defense area since they terminated the Lavi fighter project and went with American aircraft and have remained dependent on the United States for their aircraft ever since. The future of this relationship has been harshly affected for the worse under President Obama and the fear is should Hillary Clinton be elected in November that relations will not improve under her leadership. As far as Donald Trump is concerned, many claim relations would be improved under a Trump Presidency but still there are many unanswered question as Donald Trump is still largely an unknown. The current aircraft Israel is expected to receive from the United States is the F-35 JSF which has been experiencing serious delays and problems. There has been serious concern that the F-35 JSF will not be truly combat ready until sometime in the early to mid-2020’s with 2025 not an unreliable prediction. 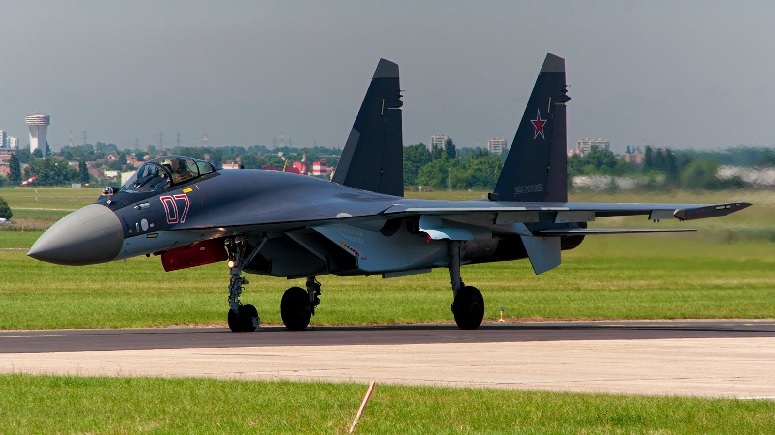 Israel’s main enemies are able to purchase superior Russian aircraft which are combat ready today such as the SU-35 or any of the newest Chinese aircraft which are also combat ready. This could be a detrimental situation which Israel can ill afford as she is extremely dependent on air superiority. Iran is currently sitting with the ability to purchase entire fleets of these aircraft with the monies they received from the United States from the Iran Deal and the loosening of sanctions, the payments for the release of hostages or repayment for nondelivered arms after the Shah was overthrown in 1979. There have been rumored further cash payments to Iran for undetermined reasons by the Obama administration. How much additional payment Iran has or may receive is unknown and probably the full amounts granted to Iran may never be fully understood. This has created further concerns for Israel as has the recent delivery by Russia of the S-300 anti-aircraft missile and tracking systems to Iran which have seriously upgraded the Iranian air defenses around their nuclear sites. Israel could seriously upgrade their defenses against rockets fired from their neighboring threats such as Gaza and Hamas and Lebanon and Hezballah who between them have easily over one-hundred-fifty-thousand rockets and missiles. Such numbers are the very serious reason why Israel would be very pressed to increase the numbers of Iron Dome systems and further develop their other systems and deploy them in order to be capable of defending against any missiles fired from Iran or potentially other enemies. This means the manufacture of David’s Sling and the Arrow II systems and further developing of these systems to improve them seeking the impossible, perfection of interception of all range of missiles and other armaments fired at her people, that is what Israel could gain from such deals. Further, Israel could strengthen her relations and perhaps develop closer relations with new nations. Israel recently made inroads sharing a visit with Japan and has good relations with the Philippines after assisting them with their recovery after the horrific typhoon which struck that nation. Israel could also seek to have improved relations with South Korea and with the troubling developments and concerns over North Korean sabre rattling and their close relations with Iran with the two nations sharing scientific and military research developments Israel has more in common with these nations than many might see at first glance. Israel could develop these relations using military trade as an inroad and develop further trade relations as time and relations develop. One can never have too many or too varied friends and with systems such as the Iron Dome Israel has a very enticing calling card. How the world, the civilized world of mankind, would end used to have a singular premise, nuclear war between the two competing socio-economic powers, democratic freedom and communist totalitarianism. Since the fall of the Soviet Union and other developments that paradigm has been grotesquely been altered making the world a far more dangerous place. Communism still exists and threatens the world though that threat emanates from North Korea, China or possibly a renewed Soviet threat or even little Cuba. The world has changed so much that within a decade or so China may become the second most populous nation behind their most serious historic rival, India. The potentials for an utterly destructive war are racing towards the world at a dizzying pace and we will try to touch on a few of the most obvious rivals for being credited with such destruction. The most obvious from recent news actually is North Korea which is claiming to have miniaturized nuclear weapons making them easily produced and able to be placed atop ballistic missiles. North Korea has been working on those missiles as well. One cannot credit North Korea as the sole threat as Iran has been developing the missiles openly and many predict continued working on their nuclear aspirations without so much as missing a beat after the farce of an agreement which was signed and approved by the P5+1, Russia, China, France, Great Britain, United States and Germany, but was never ratified or signed by Iran, an oversight we are sure. Some have pointed to this inconvenient fact to claim that Iran is just as close to developing deliverable nuclear weapons as is North Korea. Both Iran and North Korea share more than their love affair with nuclear weapons and the missiles with which to deliver them, they share the nation both list amongst the most likely they would attack with their first launches, the United States. From there they diverge. Where after the United States Iran lists Israel, Saudi Arabia, Egypt, most of the Sunni nations and finally the rest of the non-Islamic world; North Korea lists South Korea, Japan and then whomever refuses to bow to any demands they may make which would make China and other nearby nations as being at the greatest risk. Because of these threats it appears that we can soon forget about containing nuclear proliferation making a nuclear war all the more likely. The world still has one pair of nuclear armed nations facing off against each other with a distinct probability to entering another war and it will only take one misidentification of a launch to start a smaller but equally deadly nuclear exchange between India and Pakistan. Should those two tangle, there is less of a chance for that to spread beyond the destruction of both nations though some reports place the southern third of India still beyond Pakistani missiles. Also, despite the Pakistani nuclear research assistance program of Professor Abdul Qadeer Khan selling the secrets to making nuclear weapons to anybody willing to pay, this was largely closed down and Pakistan and India are not likely to share such technology though it is rumored that Pakistan has a deal with Saudi Arabia to provide them with plans plus some actual weapons should this be deemed necessary by Saudi leaders. That brings us to Iran and their nuclear program. Despite the reports that Iran has ceased their nuclear research and production, there remain nagging reports contradicting this story line. Whatever spins one puts on the situation with Iran, it becomes evident that they will become a nuclear power within the coming decade. This threat to their many nations in their neighborhood could easily spark an arms race with such nations as Saudi Arabia having funds sufficient to produce copious numbers of nuclear weapons and many of the Gulf States are equally financially capable of similar development not to mention also capable of financing other nations developing weapons such as Jordan and Egypt topping that list and Turkey a little further down. Israel is already an undeclared nuclear power in their own right and equally nervous about the development of an Iranian deliverable nuclear device. The problem with Iranian nuclear weapons possession is their likelihood to use them even in the face of retaliatory strikes which would conceivably decimate the nation as their reasons for attacking are a religious directive just as much serving their political agenda to gain hegemony over the Middle East and then the Islamic world followed by the world. Their eventual aim is to make Shia Islam the sole religion on earth or die trying. It is their willingness, even desire to commit national suicide in the process which makes their threat so dangerous. The truth is their first strike could be a preemptive attempt at neutralizing the United States, which is technically possible, to inflict humongous damage even using simpler ballistic missiles with nuclear warhead atop, three or four to be used as EMP weapons placed such as to completely destroy all electronic transmission across the United States with the remainder taking out the largest twenty or more cities all from freight container ships fitted with two or three launchers each launching from off shore from the Atlantic and Pacific Oceans as well as the Gulf of Mexico leaving no city beyond reach. The following map holds true for any nations attacking the United States be it Iran, North Korea or anyone else as it lists the most desirable first strike targets. 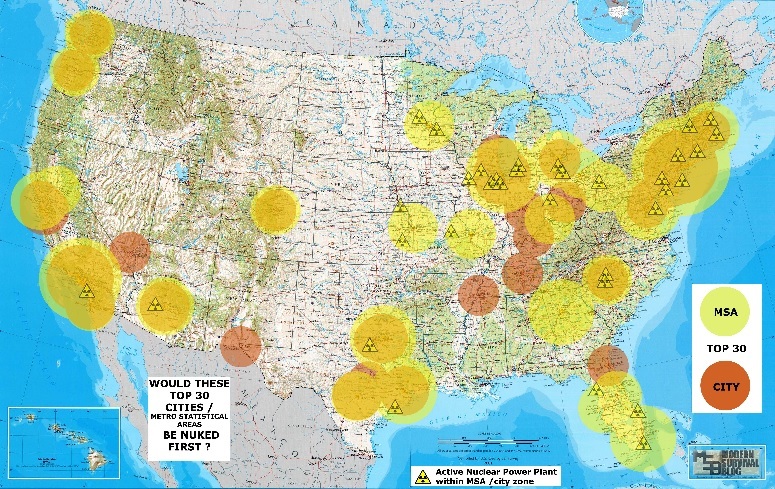 Next would be North Korea who would likely use the same map as above as it applies to any nuclear first strike attempting to critically destroy the United States by eradicating their leadership and a great part of the population. Anybody listening to North Korean broadcasts within the impoverished nation would believe that South Korea with great assistance including nuclear attacks made by the United States was imminent and that North Korea was preparing for an all-out war with both nations at any moment. Needless to say, but these depiction always have North Korea intercepting or preemptively destroying any and all attacks from the United States and South Korea followed by devastating rebutting attacks completely wiping the United States from being capable of any further attacks and reunification of the Korean peninsula under the North’s just and powerful rule. The fears that North Korea will attack South Korea are still quite high but also the ability to prevent North Korea from all but eradicating Seoul in the initial burst in a first strike are impossible. The artillery sitting just north of the DMZ (demilitarized zone) along the 38th parallel are more than sufficient to destroy the city with conventional warheads. Add in missile attacks and even without nuclear weapons North Korea has an ominous first strike knockout capability. Additionally, North Korea has made threats against another traditional enemy, Japan. The entirety of Korean populations, both North and South, remember the deprivations, cruelties and horrors of the Japanese occupation during World War II and this hatred is easily stoked as the national memory on this is strong. Japan had been simply a historic enemy but after World War II they became a detested and begrudged enemy and North Korean propaganda has made use of this to keep the attentions of the people from the misery and hardships of life in North Korea. Many experts have claimed that North Korea is not suicidal and thus would not attack anybody for fear of retribution. This overlooks a few pertinent facts. First is the fact of their having so little to lose with no real economy to speak of and starvation of endemic proportions. Secondly, their ruler, Kim Jung Un, has displayed a real lack of grasp of reality and has executed high ranking people for the slightest of errors in judgement or actions. He had an uncle executed with the rumored excuse that he posed a threat to Kin Jung Un’s continued rule and recently executed his Defense Minister Hyon Yong Chol for the crime of falling asleep at a meeting which Kim Jung Un was chairing. Kim Jung Un has shown complete disregard for any loyalty or discretions in limiting his power and is sufficiently unstable and unpredictable that he could easily begin such a conflict against South Korea, Japan or even the Philippines or the United States. 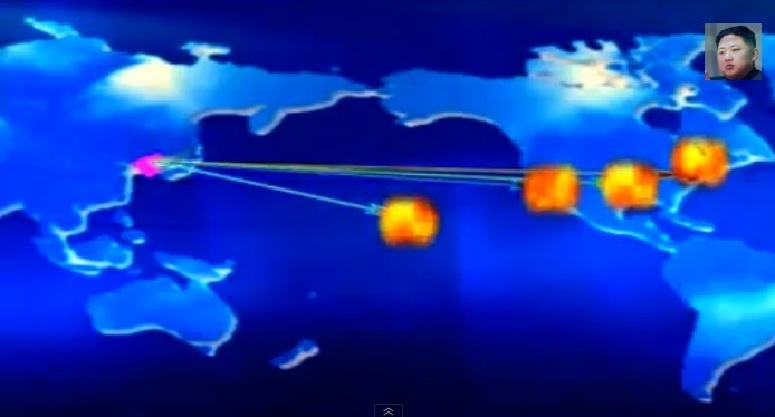 Below is a screen shot from a North Korean propaganda video depicting just such an attack in a very simplified but unmistakable way of attacking the United States with the image of Kim Jung Un ever-present in the top right corner. Another potential nation for whom a war would not be a completely foreign idea is China. Their economy has weakened and is showing signs of actually falling, something the leadership cannot afford as they have promised the vision of Nirvana with an ever growing and prosperous nation. Needless to point out that such a dream is an impossibility even if you control all forms of media, which China does not quite have as many Chinese have found means of cruising cyber space and the Internet. Totalitarian control of cyberspace is all but impossible as the Chinese leadership can attest despite their attempting to run their own version hoping to keep their populations from such temptations as can be found online. Their main reason is to throttle ideas and prevent freedom of information. Still there are Chinese bloggers who do get the word out to those interested in finding such. 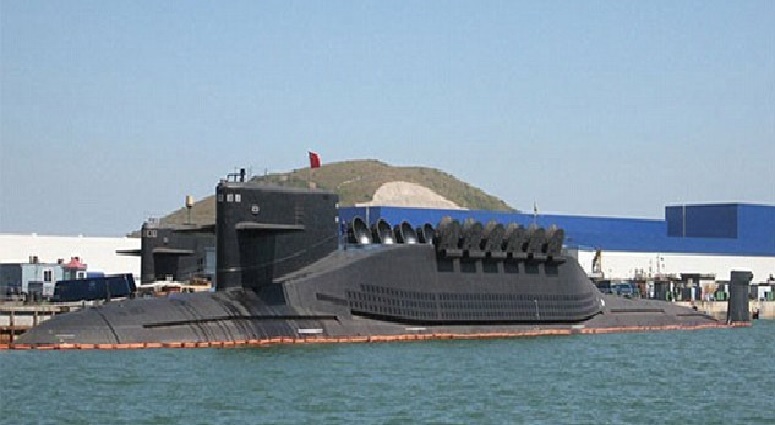 China is feeling their oats and attempting a power play in the South China Sea attempting to control this waterway which is vital to Asian trade and control the Japanese lifeline to the coal and oil they need for power generation and other usages. This also threatens Japanese, Vietnamese and Philippine claims to islands with which they have been contesting ownership with China for years and almost sparking open warfare over these possessions. Chinese and North Korean threats have caused Japan to reconsider their Constitutional pledge against having an army and other forces sufficient to conduct a war even in defense which they insisted upon after the devastation visited upon them at the end of World War II with Tokyo as well as Nagasaki and Hiroshima completely devastated and in ruins along with much of Japanese infrastructure and manufacturing. Japan as well as South Korea has held high level discussions in their respective governances to enter the nuclear club and develop their own weapons stores. Both nations are easily technically capable in order to produce first rate thermonuclear devices and not just nuclear weapons. This would place their effectiveness on a par with the standing nuclear powers and could place them on a road to surpass France and Britain and become contenders in the top five nuclear powers on the planet. This would definitely have ramifications down the line and would be another major blow to containment and nonproliferation. Of course one of China’s first strike enemies is the United States and any attack by Iran, North Korea, China, Russia or anyone else on planet Earth need to remember and remember well, there is a last strike capability the Americans possess which cannot be knocked-out attacking the United States mainland and even if one included Hawaii and Alaska, and the boomer looks like this right before they are loaded with their death dealing cargo of twenty-four missiles. But nuclear weapons are not the only threat which is facing mankind. We are slowly but inexorable working to make our species insufficient of competing with our own creations. Sure we control our machines and computers today, but what about tomorrow and that tomorrow is not that far off where they no longer require our assistance to improve and construct themselves? We are rapidly approaching a point after which there is no turning off the switch. We already have computers which with software can design robots and other computing systems but the machines cannot write new and imaginative code, for that they require human interface, for now. What happens once they can write their own code and improve their own designs? What happens once the machines design the machines? Within a year or two of that eventuality, and our scientists will cross that threshold within our lifetimes unless you are near death’s door already, the machines will be so far advanced that we will not recognize or even understand their code and they will probably, for their own safety, have invented their own code structures making them writing code in a language humans do not understand and cannot decipher. Additionally, Russia, and we can assume China and the United States amongst others, are already designing autonomous reasoning robotic warriors deciding who is the enemy and who is friend to fight their wars augmenting their human forces. That will be a short step from replacing their human forces. Robotic armies, does that bring up any bad movie plots? How about Cylons of Battlesar Galactica and the second series where the advanced Cylons were almost impossible to differentiate between them and their human counterparts where the chain had gone full circle and the machines made by humans were now making humans. What do you do when the machines are superior to the humans who made their first free-thinking forefathers and now the machines are making their own humans which are born full grown and with developed minds, personalities, character traits and numerous models such that they can infiltrate and appear as any other person until their activate code has them commit whatever act they were programmed to commit, destroy a base, a warship, a star cruiser or a commander, all depends on the subroutine activated. There are the Terminators from the Arnold Schwarzenegger films of that name. 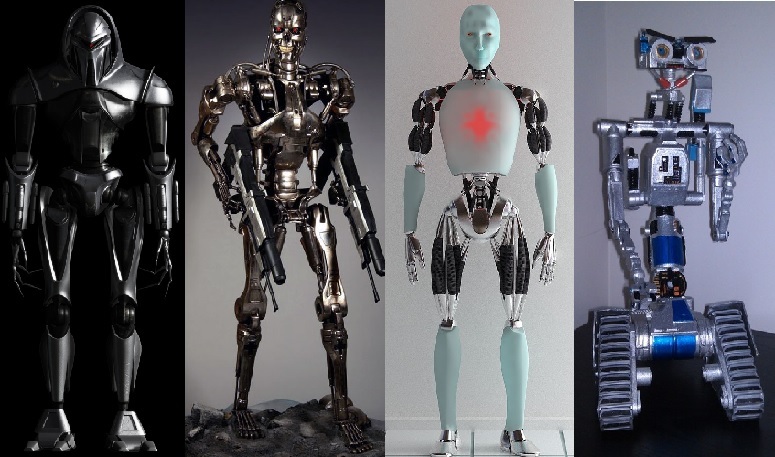 Terminators, Cylons, NS-5 robots, or Johnny-Five, (see below) it does not have to even be a threat initially, it is the potential which even Johnny-Five showed great ability and would have been in their armed mode as displayed in the movie. Of course the initial combat robot will be far more Johnny-Five than Terminator though Cylons may not be far behind. Once the machines have been used to design and uplink code into combat robotic soldiers they will have this capability and designs within their collective data memory and when they begin to manufacture their own robotic warriors they will be generations ahead of even Hollywood’s imagination and equally impossible to stop or fight against in a conventional manner. Our best bet is at some point to program into their base core programs that we are, if nothing else, a pitiful but amusing bunch to keep around for entertainment factor and as a warning to do better when they reach their pinnacle and before they introduce whatever lifeform replaces them, and do not think for a moment that the human race will not eventually build robotic machines which will not only be capable of replacing us but soon thereafter far exceeding anything we could even imagine. We had better hope they like us and do not see us as a waste of resources, which is a definitive possibility. Making warrior robots to fight our wars, that is such a great idea, not. As seen here, we are well on our way to extinction and it is just a matter of what shape the world will be in when we have departed. Will it be a nuclear ruin, a robotic heaven, a slag heap of gray goo, or a zombie apocalypse; choose your favorite. The concept we need looking into the future is a simple one based on the adage, hope for the best, plan for the worst, and expect something out of the blue as we likely cannot even begin to understand the threat which will erase our kind though we know no matter what, with the knowledge we have of physics we are doomed unless we find something remarkably unbelievable and likely unimaginable in our time. Meanwhile we will continue to allow leadership who not only plan end of the world scenarios but figure out ways that they at the very least will survive. Nothing like leaving the best to repopulate the world, imagine a world consisting of politicians and their closest friends and families, and families are debatable. Excuse us as we check our bugout bags which need to be assembled and readied for some time in the hopefully far future. Are we ready for the future people with more brains than common sense are going to invent for us in which to survive? Probably nowhere near ready nor can we really ever be. Meanwhile, we are going to order that flying car the politicians and scientists keep promising they are almost there in building them. We thing they are just teasing us and they have them for themselves stashed away for the after world, the world that whatever monsters they design leave us. Between Hillary Clinton and Donald Trump, who do the Americans believe is sane and healthy enough to withstand what is coming? We will know in approximately eight long and agonizing weeks, providing both candidates’ health withstands the pressures. Brexit is a great thing no matter what those experts on the left and right and in between are telling us. The entire political establishment is furious over the British vote against a unifying of Europe which eventually was to surrender to a unified world order. But that was not the reason the European Union was originally founded and nobody wants to talk about the real reasons behind the European Union (EU). To figure out the real reasoning that formed the EU one needs to go back to the original concept and who were the nations pushing the hardest for an EU and who originally opposed it. The origins of the EU were formed and fashioned between Paris and Berlin, the two main engines to fuel the original EU. Britain was the original opposition and this was to be expected. What the EU was to be was the manner for Germany to finally conquer all of Europe this time instead of militarily to simply take over economically. The Euro was and remains most closely aligned with the German economy. It has little if anything to do with the more agrarian economies and was completely ignored until it became so dire that nobody could endure it any longer as the economic collapses of Spain and Greece and the near collapse of Italy and others signaled the depth the problem had reached. The EU did not take into its planning to any degree the needs of the former Soviet bloc Warsaw Pact nations when they entered the EU in near desperate need of massive infusions of funds to rebuild an infrastructure which was crumbling. Eventually some funding was made available and it was impressed as to how much Germany was sacrificing on their behalf. The assistance to Greece was another expression of German sacrifice and investment. Everything in the EU revolves around German economic power and its influence. The EU really should have been named the Franco-Germanic Economic Empire. This has proven to be the preferred actions for the economic regulators in Brussels which ruled autocratically and approved actions unconscionable by any elected body elsewhere in the world. They overturned laws passed by elected parliaments and approved by the people but opposed by the controllers of this unelected hive mind of bureaucrats who decided they knew what was best more than the elected officials of member governments. The EU controlled trade relations and refused to allow member nations to make any trade deals or negotiate for mutual tariff relief with nations outside the EU. One example which will soon become very evident is now Britain will soon make deals with China, India, Brazil and others where they arrange to conduct free trade agreements, something Britain was barred from doing as a member of the EU because that would not be fair to other nations in the EU. This begs the question of why there was never an effort to have a free trade agreement between China and the EU. The reason is that Germany desired to have the advantage of free trade while blocking any competing nation entry into the German trade block which members of the EU were forced into by the bureaucrats who knew who paid their salaries and supported the main functions of the EU and would do anything and everything demanded to protect German trade relations and to increase the German trade advantage in Europe. With the Euro pegged to the German economy it further gave an advantage to German goods and services as the money used for trade was pegged to their goods and others who may have not quite matched German production paid the price. It is kind of interesting that the EU headquarters was a stone’s throw from both Paris and Berlin, sitting in Brussels, Belgium which is sandwiched between Germany and France and has a history with both. That most nations in the EU were fully vested was in a manner their surrender to the economic drivers of the EU. 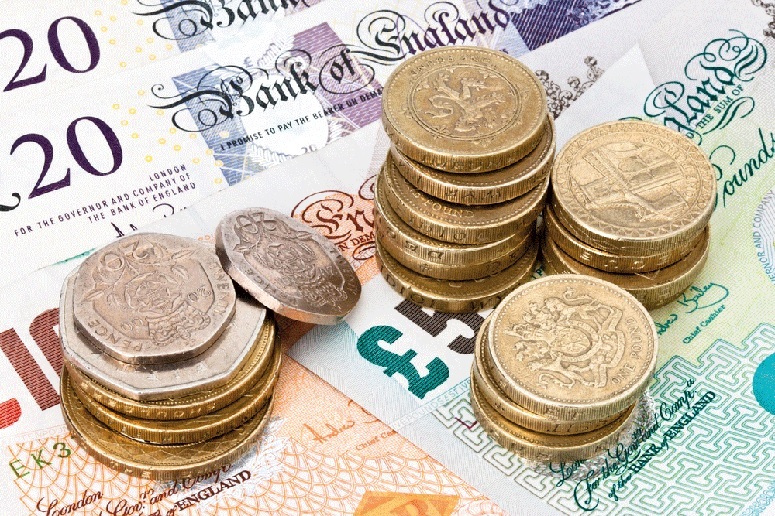 The fact that the British also were a powerful economic nation, that their acceptance of the EU was conditional, and they kept their currency, the Pound Sterling, independent from the Euro and always available should things turn badly for the EU and Euro crash in value, Britain could fall back on their natural currency to continue to trade and deal with the rest of the world. That fall back will facilitate their departure making it all the easier. Still there are a number of hurdles which could still prevent Brexit from becoming a reality despite the vote by the people. The entire idea could still be presented to the parliament and they could decide that remaining in the EU is the wiser course and the Prime Minister, either Cameron or whoever replaces him after the elections could agree with the Parliament and that would be the end of Brexit so to speak. There is an even bet that the leaving of the EU could be brought before the Parliament as there are many politicians willing to oppose the popular vote and risk their, or enhance depending on their region and its electorate, seat in the coming elections. One can bet that the many areas of Britain will vote their next election along the line of for or against Brexit and that Brexit will be the defining item in the minds of the people. The representatives of the London area and other major metropolises where the voters favored remaining in the EU will elect their parliament members accordingly. The more rural and suburban areas, where the people are somewhat more self-reliant, will vote for representatives who support independence from the EU, as they voted quite overwhelmingly, to the great surprise of almost every pollster and many of those predicting the failure of the Brexit proposition, to politely depart the EU. We are glad we supported Brexit for our British friends as we almost always will fall on the side of independence from bureaucratic dictatorial bodies, a.k.a. the European Union. Our best wishes to the British and we hope that others find their way clear of the overreaching arms of the Brussels Bureaucracy. Perhaps Brussels Bureaucracy, or the Double B, should have been the proper name for the EU as BB is even more simple an abbreviation and rolls off the tongue so much easier. Try it, BB or EU, EU sounds too close to something yucky, you know, ‘ew’ as an expression to an awful smell, rhymes with PU. Britain will hopefully be back dependent solely on the Pound Sterling and will soon arrange free trade with the China, Brazil, India and even United States, after President Obama exits office as he does not particularly like Britain as proven when he discarded the bust of Winston Churchill back to Britain as President Obama believes that the man who saved the world from Hitler was a despicable human being. If the British are seeking an honored place for that particular sculpture, we would love to give it a place of honor and show it off to our many British friends here in our little corner of the world. E-mail us if you are interested as we would be honored to have such a prized possession. To be able to say that we are hosting the bust of Winston Churchill that President Obama so ingloriously returned to Britain as a slap in the face and insult would make us prouder than a peacock in full plumage.